This free education WordPress themes was designed specifically for the education niche and comes loaded with all the features you need including the fact that it is wooCommerce compatible. With this theme, you should be able to add, edit and modify content and even the layout with use, using the built-in customizer. What’s more, it also comes with pre-built pages so you should be able to use it “as it is” and get your website up in a matter of a few minutes. Education has indeed undergone a revolution in the last few years as more educational institutions have started establishing their presence online and some have even incorporated the concept of the online classroom and have made it a reality. The fact is that the education sector is truly thriving in every sense of the word and if you want to get a slice of that pie, then it is high time that you managed to build a dynamic website, using the freely available WordPress. Of course, you could always ask as web Development Company to do the deed but that’s going to end up with you having to pay exorbitant rates for something that you could have set up in a matter of minutes thanks to our free education WordPress themes. You need to understand that most educational institutions have an online presence and if you are going to go head to toe with some of the major players, then you need a dynamic, robust site with a neat aesthetic design that’s attractive enough to get all the attention. That’s why you should check out our free education WordPress theme as comes loaded with all the features you need to make your website stand out from the rest of the crowd. You can also check out other education WordPress themes online but you will soon see that there is no dearth of the same and the issue is one of plenty. That’s why it may take you a while to sort through the lot before selecting one. Or you can cut down to the chase and start taking a closer look at our theme. Bottom line, any WordPress theme that you select must come with the requisite templates and a few static pages, for the usual error pages. You can either go for a free WordPress theme for your website or move on to the premium ones. Though these premium ones come with a little price tag, they are generally worth it, given the additional features they often come with. But remember, it all comes down to whether it is a good fit for your business or not; for example, since you are in the education sector, your users would want a menu based architecture with information on the various courses that you offer – which only makes sense. So naturally, you may want to go for a theme that comes with a drop-down menu and is compatible with page builders so that you can easily build your other pages with ease. And after setting the basics of the website up, you can then move on to customizing it. 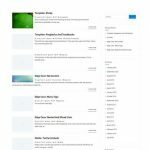 Our free education WordPress themes were specially designed for educational institutions, tutoring companies, and others so it should be a good fit for your business. Moreover, it comes loaded with all the plugins you need and the premium ones also come with parallax scrolling which is a plus. Your students should be able to access all the information they need, right from the home page. Moreover, you can use widgets and sidebars to showcase specific and important information and even set up a special section for announcements. What makes our theme one of the best is the fact that we have gone the extra mile to provide you with a multi-purpose website that you can customize and set up as you please, with all the relevant and important information being listed on the main page with links to secondary pages. Given the fact that most users often suffer from a case of short attention span, you may want to check out the websites of some of the top educational institutions and adopt a similar approach.